The E/V Nautilus team recently released a video showing a natural whale fall. The National Oceanic and Atmospheric Administration explains on its website that a whale fall is a dead whale's carcass which typically ends up sinking to the seafloor. The video shows parts of the whale's remaining skeleton, including the vertebral column. 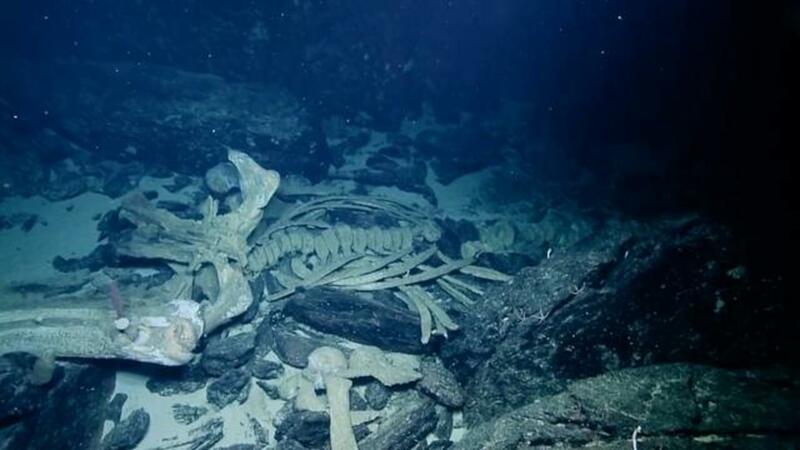 As the camera continues to focus in on the bones, one of the crewmembers can be heard saying that "coming across a natural whale fall is pretty uncommon. Most of the whale falls that have been studied have been sunk intentionally at a certain spot..."
Once settled, the carcass becomes a rich food source for numerous deep-water organisms. The crew also noticed a "mysterious white orb" attached to the whale's skeleton with one scientist suggesting it could be an anemone. The observation was made off the waters of Southern California.